Chelsea vs. Paris St. Germain : 11 March 2015. I had been back at work for three days, and it had generally felt right for me to be back in the swing of things. The seemingly mundane routine of work had certainly helped my gentle and steady recuperation following the sadness of recent weeks. However, throughout Wednesday, I felt myself getting quieter and quieter as the hours passed. The quietness and the stillness were of course due to my mother’s funeral on the Thursday. The Wednesday evening game at Stamford Bridge between Chelsea and our new rivals PSG was of course still important, but much less so. Of course, it goes without saying, that I wanted us to reach the last eight of this season’s competition. For some reason, I had doubts that we would do so. There was just something about the law of averages; we got past them a year ago, it might be their turn this time. Our draw at the Parc des Princes was largely due to the excellent performance by our young ‘keeper. However, as the day progressed I was just aware that my focus was elsewhere. My mother’s funeral was looming over everything. In addition to the emotion of Thursday, a great deal of my focus throughout Wednesday was centred on the safe arrival of my good friend Roma and her eight year old son Shawn, who had arrived at Heathrow during the morning, and were planning to meet me at West Brompton underground station at 6pm. I first met Roma in her home town of St. Augustine, Florida in 1989 and we were a long distance item for a few years. Our friendship has remained intact after all this time. On hearing of my mother’s passing, it filled me with joy when Roma, now living in Tennessee, told me that she would like to attend my mother’s funeral. I last saw Roma and Shawn in “Stan’s Sports Bar”, just after our friendly with Manchester City at Yankee Stadium in 2013; the two of them had to leave early to head home, while I stayed on for a few after match beers. Shawn had also witnessed our game with PSG at Yankee Stadium the previous summer too, and I have lovely memories of the two of them, plus Roma’s eldest daughter Vanessa, posing for a photograph with Paul Canoville after that game. Shawn has lovely curly locks, and I called him David Luiz Junior at the time. Now, in 2015, Shawn and Roma would be reunited with me, Chelsea, PSG and David Luiz once more. Just like me, in 1974, Shawn’s first Chelsea game at Stamford Bridge would be at the age of eight. It felt right that the torch was being passed to another generation. The stalwarts from my home area, Lord Parky and PD, travelled-up with me from Chippenham. I made good time and was parked up in a little over two hours. They disappeared to The Goose while I zipped over to West Brompton. Now, for my good friends in the US, some of you will have met Roma and her three children on many occasions over the past eleven seasons, since Roma has attended matches from every single one of Chelsea’s tours to the US. Roma even has “one up” on me, since I didn’t bother to attend any of the three games during the 2013 summer tour, but Roma and Vanessa visited DC for the Chelsea vs. Roma game. A few close friends also know that Roma’s time-keeping is – and I know Roma won’t mind me saying – rather errant. I received a message from Vanessa that Roma’s ‘phone wasn’t working, either. I had visions of waiting at West Brompton for…well, for quite a while. Imagine my elation and relief when, at just before 6pm, I spotted Roma and Shawn outside the station. I gave them big hugs. From the South Bronx to West Brompton, our friendship was rekindled. Without any prompting from his mother, Shawn quickly said how sorry he was to hear of my mother’s passing. I melted, and gave him another hug. Until this point, I had only managed to secure one ticket – for Shawn, he would be sat next to me – for the evening’s game. Roma was going to watch in a pub or bar. However, soon after setting foot in The Goose, another ticket became available and – an extra bonus – we were able to move people around so that Roma and Shawn could sit together in the MHL. My good mate Tuna, who has been living in the US for around thirty years, had flown over from Atlanta for a few games and, of course, Roma and Tuna have met on many varied occasions, stemming as far back as the Chelsea vs. Roma game in Pittsburgh in 2004. It was lovely to see him in the pub, too. In some respects, this was all turning out to be a typical way for me to cope with my grief of recent weeks; I had spent a few hours over the previous week or so sorting tickets, planning to meet up with friends, planning itineraries, making ‘phone-calls, sending emails. There was a complex transfer of tickets planned for the Southampton game on the following Sunday, too, with the focus again on getting Roma and Shawn two seats together. All of this football-related activity was a lovely balance to the weightier issues also on my mind. Chelsea therapy, if you will. Lovely. Roma, Shawn and I departed from the pub in good time and I chatted about a few Chelsea-related items on the way down to the ground. I spent a few moments trying to explain the peculiarities of European games to Roma, the aggregate score, and the “away goals” scenario. Of course, there was also the threat of penalties. Roma was far from the naïve American though; she soon impressed me with a few comments about Harry Kane and his goal tally this year. Roma had previously visited The Bridge once before, for a Chelsea vs. Fulham derby in 2002. Roma watched many of the World Cup games in the summer on American TV. She has come a long way since that 2002 game. Programmes were purchased and photographs were taken. I escorted them down to the turnstiles for the MHL and then made my way into the stadium myself. It was earlier than normal, maybe 7.30pm, and there was no line at the gate. Inside there was a hug from Alan. PSG had brought around 2,500 maybe. Throughout the night, there seemed to be a split in their support; the rowdier elements with scarves and songs were stood in the lower tier, while those in the upper tier remained seated, and quieter. Before I knew it, the stadium was bathed in blue, with thousands of the new-style, predominantly blue rather than chequered, flags being waved during several pre-match songs. It was a fine image. Just before the entrance of the teams, a new flag was held aloft in the MHL. The front cover of the match programme had been devoted to a message aimed at addressing the nasty incident in a Parisian metro station prior to the away leg. The same message was on the flag. I quickly ran through the team. Dave – JT – Gary – Brana. Hazard – Oscar – Ramires. No Zouma, no Willian. In Jose we trust. By now, several days after the game, no doubt that every kick of the ball will have been dissected a million times by a million experts. I am not going to say too much. It was clearly a game of football that was easily within our grasp of winning, yet we failed. Throughout the game, I was not my usual self. I hardly sang at all. Other things flitted in to my mind, and stayed. Overall, the atmosphere wasn’t great. In fact, it was rubbish. Even the away fans weren’t particularly noisy. As I looked down at the spectators standing en masse in the Matthew Harding Lower, I wondered if young Shawn was able to see anything. I wondered where their tickets were. At times there was noise in that section; for Roma and Shawn, I wanted it to be rocking. Not exactly our wittiest or most erudite moment, but I guess it summed things up. In the first-half, PSG played some good stuff, with their attacking play occasionally stretching us. Of course the most important moment was the crunching tackle on Oscar by Ibrahimovic. To be quite honest, my focus was on Oscar’s outstretched leg going for the ball and I only really saw a coming together of limbs. I commented soon after to Alan that a split-second later, perhaps it could have been Oscar seeing red. Regardless, off went PSG’s talisman. The portents were looking good. A run by Diego Costa – a wonderful run actually, with him keeping the ball tight to his body amidst lunges by several defenders – was ended with a trip by Cavani, but I noted that the referee’s view seemed to be blocked and no penalty was given. At the break, I wondered if it might stay at 0-0 and it would be a night of equality. Willian replaced the very poor Oscar and soon tested Sirigu with a direct free-kick which surprised everyone. On the hour, we had a massive escape. Our defence was caught upfield and the impressive Cavani ran clear and then rounded Courtois, only for his shot to hit the far post, although I was pleading for our defenders to hack it clear if it had been on target. Players were being booked right, left and centre. We rarely tested the PSG goal, but a corner on eighty-one minutes caused deliberation in their box. I snapped as Diego Costa swung a leg at a loose ball, but completely missed. Gary Cahill was close by to thump the ball home. We were one-up with ten minutes to go. I snapped the run of Cahill into the arms of substitute Drogba, warming up on the far corner. Zouma replaced Matic. Mourinho was solidifying the ranks. PSG kept pressing and Courtois was able to beat out a couple of attempts. However, on eighty-six minutes, David Luiz rose at the near post to head home a corner. Him. Of all bloody people. He had been booed by a section of our support all night. He celebrated wildly. Extra-time, then. Great. With a big day ahead of me, this wasn’t going to plan. Mourinho replaced Ramires with Drogba. Inwardly, I wasn’t happy. Drogba is hardly the player of old. I wondered if this was a wise move. Although the referee pointed to the spot, there didn’t seem to be a reaction at all from the home crowd. It was a very weird sensation. It was as if we didn’t believe it. Eden Hazard calmly rolled it home. Possibly, probably, almost certainly undeserved, but advantage Chelsea. 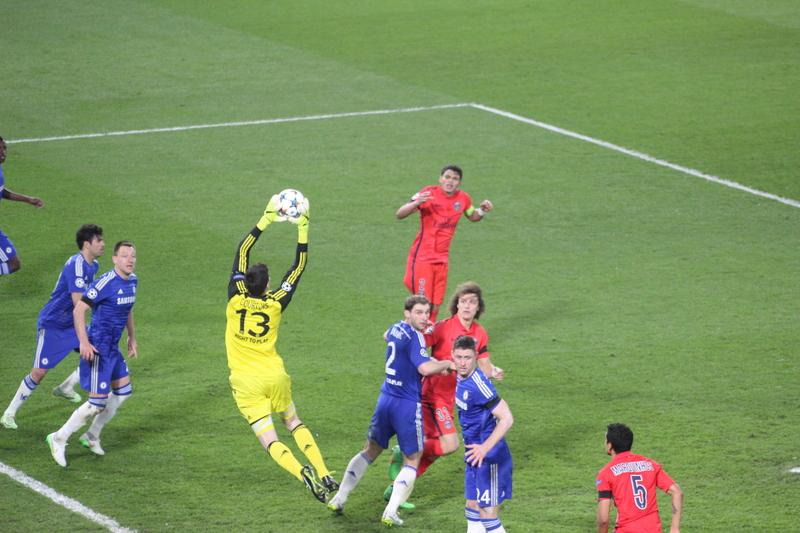 Just after, an incredible, dipping free-kick from David Luiz was expertly tipped-over by Courtois. As the second period of extra-time began, there was nervousness in the West London air. A corner for PSG was headed down and goal-ward by Thiago Silva, but Courtois dropped to his right and palmed it wide. It was a magnificent save. I was still praising his efforts when the resulting corner was lofted high and the very same Brazilian player connected. It looped up, and dropped in to the net, in horrible ghastly slow motion. I gathered a few spare flags for young Shawn and said my goodbyes to the boys. It was not to be. There would be no repeat of Munich in Berlin. This entry was posted in Season 2014-2015 and tagged 2014-2015, Champions League, David Luiz, Parents, Paris St. Germain by Chris Axon. Bookmark the permalink.